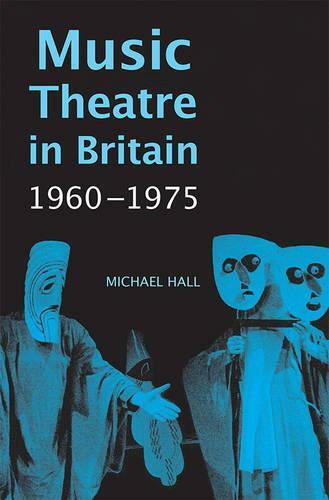 Based on Michael Hall's many interviews with leading British composers of the genre, this book looks at the heyday of the British Music Theatre in the 1960s and 70s, a period when the author as a BBC radio producer was actively involved with the contemporary music scene. Music Theatre - a composite of music, singing, dancing and speaking distinct from traditional opera and ballet - has its roots in works by Monteverdi, Schoenberg, Satie, Stravinsky, Weill, Hindemith and Eisler, but flourished anew in the 1960s, in America, Britain and Europe. Hall's book presents an account of the context for the activity of Birtwistle, Goehr and Maxwell Davies; it uncovers details of little-known early works by other major figures such as Cardew and Tavener; and it recognises the highly distinctive contributions of composers whose works are less well known. Music Theatre in Britain also throws new light upon the reaction of British composers to the economic and social upheavals of 'the Sixties', offering a distinct and valuable contribution to our understanding of the relationship of the post-war musical avant-garde to social movements and ideology. Music Theatre in Britain will be of interest to all those working in the field of late twentieth-century British music, to students of composition, and to composers, performers and producers of Music Theatre. MICHAEL HALL, who died in August 2012, had a long career as a conductor, founder of Royal Northern Sinfonia, BBC producer and broadcaster, university lecturer and writer on music.